1. Peel the celeriac and parsley root, then grate them both. Mix with all the remaining ingredients in a bowl, seasoning with salt and pepper. 2. Heat a little oil in a frying pan and, when hot, place spoonfuls of the mixture in the pan and cook for 4–5 minutes on each side, until golden and crisp. 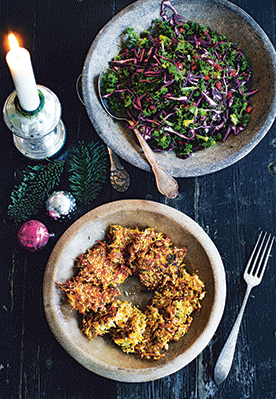 Tip: If you can’t get hold of parsley root, these fritters can be made with celeriac alone. 1. Cut the pomegranate in half over a bowl lined with a sieve to catch the juices. Take out the seeds and reserve 2 tbsp of the juices collected for the dressing; set aside. 2. Thinly slice the cabbage and roughly chop the kale. Mix the cabbage, kale and pomegranate seeds together in a bowl. 3. For the dressing, mix the 2 tbsp pomegranate juice with the lime juice, grapeseed oil and honey, with salt and pepper to taste. Just before serving, toss the salad in the dressing, seasoning with salt and pepper.